Here are several examples of how generous donations, volunteerism, and funds raised by the CSO’s special events have benefited the park, its visitors and its wildlife inhabitants. What is the Hillsborough River State Park Preservation Society? Hillsborough River State Park Preservation Society, Inc. is a volunteer Citizen Support Organization (CSO), which was founded in 1993. This not-for-profit Florida Corporation was established to support the needs of Hillsborough River State Park and Fort Foster Historic Site. Read our Code of Ethics. Like other state parks in Florida, Hillsborough River State Park and the Fort Foster Historic Site have programs and physical needs which go beyond the state’s ability to provide funding and support. This is where the Preservation Society comes in. By generating additional support for the park in the form of fundraising, supplemental staffing, equipment, etc., we are aiding the park in fulfillment of it’s mission. Maintaining state park facilities takes lots of paint and attention to detail. Florida's state parks are award-winning in part due to the efforts of the Citizen Support Organizations and their dedication to helping people enjoy the Real Florida. The park currently provides resource based recreation through exhibits, educational programs and activities, special events, as well as, many other valuable visitor services. Become a member! As a member, you help us enhance the various programs services offered within the park. Through your involvement, you can help increase the interest and understanding of the heritage and natural environment of the park. You can help implement projects approved by park management in the Master Plan. Member benefits include a periodic newsletter, invitations to private functions such as dedications and annual meetings, and the satisfaction of knowing you are making a positive contribution to Hillsborough River State Park, Fort Foster Historic Site and the Florida Park Service. 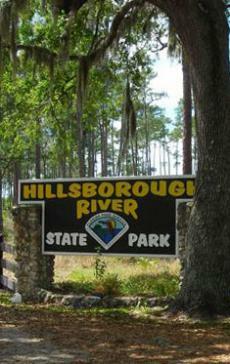 The Hillsborough River State Park Preservation Society, Inc. is a non-profit organization under section 501c3.